journey. The track was in supreme condition and made for some exciting racing, thanks to the track owner Rob Wood. The weather was on our side, enabling the riders to enjoy such an outstanding track. With a total of 185 riders, the weekend was set to see battles and extreme racing. Open riders got the race day off to a start with Darryl Maxwell showing a dominant performance in each of the three racing taking the win in each. Connor Halligan also showed a master class performance taking second in the three races of the day. Henry Siddiqui was able to take third place in race one and two and Troy Beck taking the final podium spot in race three. Overall results for the day Darryl Maxwell, Connor Halligan and Henry Siddiqui. each race leaving the fight for second and third. Hayden Statt had an excellent start and fought hard in the race. He took second place in race one with a great ride by Archie Britton seeing him take third. In race two Archie Britton managed the second place with Blake Ward-Clarke taking third. Race three saw Archie Britton take another second place with Aimus Peckham taking third. Overall results for the day Ben Casey, Archie Britton and Hayden Statt. and three Kyron Carron was able to pull a gap from the field and take third spot in each of the races. Overall results for the day Harvey Antrobus, Kayden Smith and Kyron Carron. Small Wheels riders were dicing it up and the races could have been taken by anyone. In race one Arai Elcock and Bayliss Utting were challenging one another to take the win. Arai worked hard and was able to hold off Bayliss to take first place, with Baylis taking second and Freddie Wyard third. 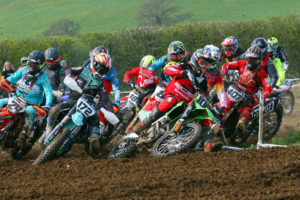 In race two Bayliss Utting took the lead and held on, pulling away from the challenge of other riders. Bayliss took the win with Arai Elcock second and Harrison Forde third. In race three Arai and Bayliss were once again competing hard and displaying some impressive riding from the youngsters. Arai took the win with Bayliss taking a comfortable second and Harrison Forde a well earnt third. Overall results for the day Arai Elcock, Bayliss Utting and Callum Murfitt. The Senior racing also saw some mixing up in the results as the riders were challenging to the very end in each of the days three races. In race one Todd Leadbitter took the lead and was able to pull a gap to the next riders. Todd rode a commanding race to take the win, leaving Ryan Allison and Toby Avis fighting it out for second and third. Ryan was able to hold on to second with Toby closing the gap with each corner to take third. In race two Ryan Allison got to the front and wasn’t going to give it up easily. Ryan saw of the challenges made and took the race win with Drew Anderson taking second and Toby Avis third. In the final race of the day it was all to play for and the challenges were coming thick and fast from all directions for the top for riders. Drew Anderson worked hard to take the win with Todd Leadbitter taking second and Toby Avis third. Overall results for the day Drew Anderson, Todd Leadbitter and Ryan Allison. AMX riders were out next and Dylan Hodgkins ruled the race day. In each of the races Dylan was able to take the lead and pull away from the rest of the field. Dylan took the lead in each race with the battles commencing behind him. In race one and two the fight was between Ben Spill and Daniel Clark. Each gave an exciting performance with Ben holding on to take second and Daniel third. In race three Danny Budd got into the mix and worked hard to take second place, placing Ben Spill in third spot. Overall results for the day Dylan Hodgkin, Ben Spill and Danny Budd. The Vets racing saw three riders work exceptionally hard to gain the three top places in each of the days races. Matt French gave an outstanding performance and was able to take the lead in each race, coming away with the win. Paul Willis showed the same passion and commitment to take second in each race and Stevie Gesner third. Overall results for the day Matt French, Paul Willis and Stevie Gesner. Round 11 saw the track remain in an excellent condition after the rain Saturday evening, lending itself to some more enthralling racing to see. The day saw an increase in the amount of riders ready to race. With almost 200 riders all wanting to enjoy the track and battle hard. The day started off with the Vets class and three outstanding performances by three top class riders. Matt French gave an exhilarating performance taking the lead in each of the days three races and holding on for the win in each. Paul Willis was challenging hard and biting the heels of Matt, but to no avail. Paul rode comfortably to take second in each of the races. Stevie Gesner rode strongly and was able to pull away from the other riders to take third in each of the three races. Overall for the day Matt French, Paul Willis and Stevie Gesner. Next out were the Open class with a real mix up of racing. Race one saw an enthralling battle take place between Darryl Maxwell and Connor Halligan. The racing was intense to watch and whilst this battle was taking place, Connor Hughes was clawing back to catch them. Darryl took the win with Connor Halligan second and Connor Hughes third. In race two Connor Hughes and Connor Halligan were pulling away from the rest of the field and continuously defending their lines to prevent any passing. Connor Hughes managed to take the win at the last moment with Connor Halligan second and Charlie Putman third. Race three saw Connor Hughes pull a large gap from the other competitors to take a comfortable win with Connor Halligan second and Piers Skinner third. Overall results for the day Connor Hughes, Connor Halligan and Piers Skinner. Auto class saw an impressive start for Hayden Statt. Managing to pull away from the other riders and worked hard to maintain the position, taking the race one win. Ben Casey worked his way through the pack to take second place with Aimus Peckham taking third. Race two saw another spectacular ride by Hayden Statt who rode hard to take the win. Ben Casey coming home in second with Archie Britton third. In race three Ben Casey was not going to let anyone stop him from taking the win. Riding hard and managing to pull a large gap to the next position, Ben crossed the line in first place. Hayden Statt and Archie Britton were challenging one another hard with Archie taking second and Hayden third. Overall results for the day Ben Casey, Hayden Statt and Archie Britton. In the Junior class race one saw the days racing was going to be exhilarating to watch. Harvey Antrobus managed to take the lead and was able to pull away taking a well-deserved win. Harvey Packham rode a strong and steady race to take second and Kai Thorpe rode with passion and determination to take third. Race two saw the door open for Kayden Smith and he took the opportunity. Kayden rode with grit and was able to take a comfortable win having pulled away from the other riders. Luke Richardson and Kyron Carron worked hard to take second and third. Race three saw another class performance by Harvey Antrobus to take the win with Kayden Smith taking second and Luke Richardson third. Overall results for the day Harvey Antrobus, Kayden Smith and Luke Richardson. Next out were the Small Wheel riders. The racing was tight with a battle at the front in each of the rides and open for the taking. Race one saw a real battle taking place between Bayliss Utting and Arai Elcock. Both riders showing dominance and commitment, it could have gone to either one of them. Arai held on to take the win with Bayliss second and Boston Gilbert a well earnt third. Race two saw Boston Gilbert hanging on to Arai Elcock and stay with him to challenge at each and every corner. Arai held on to take an excellent win with Boston Gilbert second and Bayliss Utting third. Race three saw another strong battle taking place with Arai Elcock and Boston Gilbert. Arai took the lead but had to ride hard and defensive to maintain it to take the win over a very strong ride by Boston Gilbert. Callum Murfitt also has to ride a defensive race to take third. Overall results for the day Arai Elcock, Boston Gilbert and Bayliss Utting. The Big Wheel class saw three competitors stand out in the days racing. In race one the challenges were coming thick and fast and the win open for the taking. Thomas Harris showed some smooth and skilful riding, enabling him to see off the challenges made to him by his fellow competitors. Thomas Harris took the win, closely followed by Tom Sedgwick I second and Dexter Millbourne wrapping up third. In race two Thomas Harris had an amazing ride, showing true strength by pulling a large gap between himself and the other riders. Thomas took the win with Tom Sedgwick taking second and Dexter Millbourne third. Race three saw another breath taking battle between Thomas Harris and Tom Sedgwick, with the racing going on between the two for the entire race. Thomas Harris was able to hold on for the win with Tom Sedgwick second and Dexter Millbourne third. Overall results for the day Thomas Harris, Tom Sedgwick and Dexter Millbourne. The Senior race was as exhilarating as ever with the top spots continuously altering and the challenges continuing all the way to the line. Race one saw Drew Anderson, Ryan Allison and Todd Leadbitter battling between themselves and waiting to pounce at an open opportunity. The race was taken by Todd Leadbitter with Drew Anderson second and Ryan Allison third. Race two saw Ryan Allison and Drew Anderson race an exhilarating and nail biting race where neither one were going to back down and mental strength also having to play its part as well as incredible riding. Ryan Allison took the win with Drew Anderson second and Todd Leadbitter third. In race three Ryan Allison was able to take the lead and maintain the position to take the in with Todd Leadbitter second and Drew Anderson third. Overall results for the day Ryan Allison, Todd Leadbitter and Drew Anderson. The final racing of the day was the AMX riders. In each of the three races a dominant performance was demonstrated by Jordan Bachelor taking the wins with a large lead. In race one Daniel Clark worked tirelessly to take second and Ben Spill third. Race two saw Daniel Clark gain second again with Danny Budd taking third. Race three saw Daniel Clark again taking a strong second place with Danny Budd third. Overall results for the day Jordan Bachelor, Daniel Clark and Danny Budd.